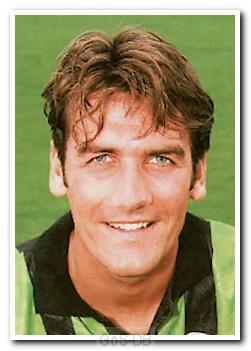 Sat at his desk in a Warwickshire office building, Richard Landon was told he had a call from a “Mr Peter Shilton”. Sensing a wind-up, Landon almost didn't take it, but was soon very glad he did. The England legend and Argyle boss had been alerted to Landon's prolific goal-scoring form for non-league Bedworth United, and was keen to take a closer look at the 23-year-old's abilities down at Home Park. Following a successful trial, Argyle paid £30,000 to take the big striker to Devon – despite chairman Dan McCauley insisting a great deal more cash was available to sign a more established forward. But Shilton and his assistant John McGovern had seen what their former manager Brian Clough had achieved with Gary Birtles, a striker they had signed from non-league to great success, and were keen to repeat the trick. Initially, it seemed like the gamble had failed. Landon was in awe of the famous managerial duo and his high-flying team-mates, and his form for the reserves was hardly reflective of a player who had scored 31 goals in 33 games that season. However, a pep-talk from Shilton forced him to pull his socks up, and he scored his first goal in league football as a substitute at Brentford in April 1993. Four more goals would come before the season's end, including a memorable hat-trick in the 8-1 win at Hartlepool. Landon was preferred to Kevin Nugent in the playoff double-header against Burnley, but failed to extend his potent end-of-season form as the Pilgrims missed out on a trip to Wembley. The following season was a frustrating one for Landon. Injuries limited his availability, though Shilton seemed reluctant to pick him even when he was fit, and just seven goals all season was enough for new boss Neil Warnock to ship Landon off to Stockport County. Spells at Macclesfield, Rotherham, Hednesford and Altrincham followed, before he returned to Stockport to take over as the club's kitman.